Energy is integral for an individual and collective progress of the society. It has become a strategic commodity considering the implications it has on sustained growth of economy and human development. Hence, it does not come as a surprise that it has acquired centre stage of policy formulation for e.g. India Technology Vision 2035. International Energy Agency defines it as “an uninterrupted availability of energy source at affordable price. Stakes for India become particularly high, as it aims to be a developed nation by uplifting many from clutches of poverty, up scaling basic infrastructure, provisioning of basic necessities developing human skill, employment generation and manufacturing abilities. Energy is pivotal for given objectives, and such ambitious target achievement will push energy consumption many folds. Unfortunately, India is energy starved in terms of availability per unit and development of other sources of at present. 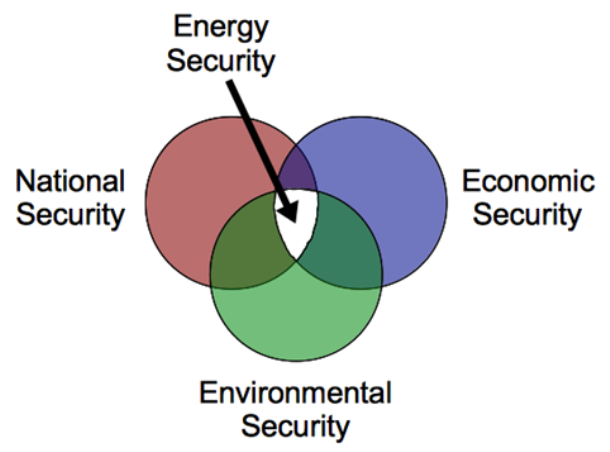 Multi-dimensional aspect of energy makes it a matter of national security. Energy is categorised as conventional and non-conventional. The Conventional Sources of Energy includes coal, petroleum, natural gas etc. while the non-conventional energy consists of solar, wind, geothermal, and biogas energy. The other classification is on scale of use i.e. commercial purpose using coal, oil and gas, hydro, nuclear etc. and non-commercial like fuel wood, charcoal, cow dung or animal waste. The total energy mix of the country is predominantly fossil fuel, with coal being the largest contributor. According the data released by the Central Electrical Authority of the totalled installed electricity generation capacity, highest input of 61 % was from Coal. This share of fossil fuel jumps to 70% once contribution of gas is included. However, the share of renewable energy (RES) has been witnessing a rise and constitutes 13% of the total installed capacity in the country. Nuclear staggers at 2% merely. India is the fastest growing economy with FY16 recording a 7.6 % GDP growth. A strategic component of this growth is the easy and cheap accessibility of the energy. 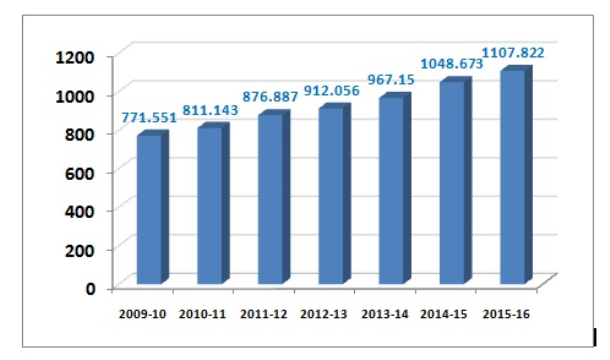 The CAGR in India’s primary energy demand for the period 2006-10 was by 8.3% and shows an increase corresponding to the needs of an expanding economy. Looking at sector wise energy demand, the largest has been from industry, which doubled in value addition with corresponding increase in commercial energy usage share at 45%. The overall pace of growth in energy sector that once had high share of renewables (mainly from large hydro projects) in its energy mix has over time tilted towards a larger increasing fossil fuel based share in its generation capacity to meet the increasing demand. Further, the data FY 14 show that India’s net energy import bill was around 6.3% of GDP to support the supply shortages, and it can spike significantly in the next decade. According to Indian Energy Security Scenarios (IESS) which has been developed as energy scenario building tool, India’s usage and demand at 2047 remains grim. Sector specific statistics show that energy demand from the Industry will jump 5 times from the current level. Similarly with increased economic development, there is expected to be an increase in mobility and demand for both inter-city and intra-city passenger transport in India over the next few decades. This will put an additional pressure. Apart from this Agriculture, Cooking, Electricity, Telecom are other areas where the demand is likely to scale-up steadily. The government aims complete rural electrification by 2020. So far the energy demand of rural population was met through traditional sources like fire wood, or kerosene. The shift that is underway is towards conventional sources of energy that invariably has increased pressure in the demand of the fossil fuel based energy. India’s share of energy consumption stands at 3.5% of the world’s global energy consumption and is likely to be 10% by 2031. The total energy generation was 1048 Billion Units and for the 12th plan period (FY 13-17), the Government of India has targeted capacity addition of 88,537 MW. A majority of this energy derivation will be thermal based. Coal continues to dominate the energy sector profile in the country. About two-third of the country’s commercial energy demand is being met by it. India’s coal based power generation capacity has jumped from 76 GW in 2008 to 164 GW in 2014, in line with expected increased coal use. Two reasons are most pronounced for the coal dependence. Firstly, India’s own significant coal reserves. Secondly, Thermal based plants providing good base load factor. India is believed to have large resources of coal estimated at 267.21 billion tonnes as on 2009. Despite this the coal import has become a norm to meet the power requirement. The mismatch is because a large part of coal reserve is not extractable owing to its location and depth. Another issue which pushes imports is high ash content, expensive transportation and high cost of production owning to obsolete technology. Oil and gas, also fossil fuels, are indispensable to energy sector. Over the period their production has stagnated on account of natural deficit in India. More than 60% of its demand is being met with imports. Gas based power generation got impetus in 80’s with discovery of gas in the west coast and functioning of HVJ pipeline. The generation capacity in field of natural gas was 24 GW at the end of 11th five year plan but clearly outpaced by the demand for it. Fall in the domestic production, transnational gas pipelines not taking off and lack of infrastructure to support capacity addition has critically marred the prospects of this energy source. Other significant area of power in the country is Hydro. India is blessed with a high hydropower potential. Ending May 2016 the total generation capacity from this sector stood at 42783.43 MW. India stands fifth in terms of exploitation of this source, nonetheless it accounts only to 25% of the total potential. Several issues have beset its development like risk sharing, R&R, non-agreement in case of international rivers, delays in project implementation etc. India’s nuclear energy capacity stands at 5780 MW with 21 reactors, and is set to increase through its 3 phase program. The government plans to induct 63000 MW of nuclear energy by 2032. Though there is a gradual increment in installed capacity with Kudnakulum reactors, but recent events in Japan raised the curiosity among people regarding safety of nuclear energy and forced the government to roll back its ambitious plans. Gulf Crisis of 1990 brought forth the concept of energy security. Recognising the susceptibility associated, India framed policies and directives to protect the country from deficit situation. Despite the measures taken, energy security is still a question lurking in front of policy makers due to various dimensions associated that complexes this problem further. Firstly, Dependence on Fossil Fuel continues to be a worrying trend about India’s energy profile. A large fragment of commercial energy consumption is driven by fossil fuel despite India being deficit in terms of supply and resource availability. This dependence has directly fuelled increasing import bill for the country. Secondly, Geo-politic vulnerability, transfers the shock directly to import dependent country like India. Fluctuation in prices, war, breakdown in international supply and other issues constantly mar the prospects. Thirdly, Use of obsolete technology, has increased the production, mining and exploration costs. Increased cost in the unit of power has made many providers to switch over to imports than developing India’s own resources. The other issue associated is delay it has caused to shift towards clean energy. Indigenous production of such instruments is also costly compared to other countries. Fourthly, Climate Burden, of the energy production is an important factor. A large dependence on fossil fuel has already placed India among highest CO2 emitter. Added to this, issues like impact to ecology by hydro projects, inundations, clearing of forest areas, danger of radiation etc. have to be considered. Fifthly, Infrastructure gaps, negatively impacts the capacity generation, its transmission and distribution. In a scenario when India is already trying relentlessly to push the generation potential, inadequacy of infrastructure creates huge losses and pushes back the effort to meet the deficit. The increasing gap between the energy demand and supply and other problem associated with conventional energy sources has inspired to look beyond and make a progressive shift towards renewable energy. Not only are they indigenous, non-polluting but are virtually in-exhaustive. India, being a tropical country, enjoys abundant sunshine. India’s topography provides ample opportunity for using solar, wind and small hydro resources. Country with its vast land resources can sustain production of significant quantities of biomass. Renewables have enormous potential to meet the growing energy requirements of the increasing population, while offering sustainable solutions to the global threats of climate change. India at present is the fifth largest producer of the renewable energy and contributes 13% to the total generation capacity. Wind energy development began in 1990’s and has increased significantly. As on March 2016, the total installed wind capacity was 26,769 MW. 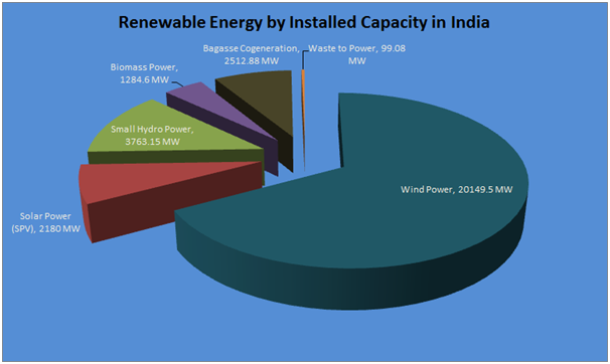 Wind energy has the largest share in the renewable and with this output India is the fifth largest producer of wind energy as well. Tamil Nadu has the highest share. The government has an ambitious plan to generate 60,000 MW wind energy by 2022. Solar Mission will see a roll out 1, 00,000 MW by 2022. Further, the potential of hydro power is immense in the country. Small hydro projects which harnesses energy from flowing or falling water from rivers, rivulets, artificially created storage dams or canal drops for generation of electricity with capacity of 2 MW to 25 MW too add significantly. With 5415 sites identified for installation of projects, the sectoral contribution 4273 MW. Biomass and waste to energy with 4831 MW and 115 MW respectively have significant contribution as well. India has set forth an ambitious target to expand its economy. Every percent increase in the development scale and rate comes with use of basic level of energy. A large part of this energy will continue to be fossil based. Referred as dirty fuels, coal, oil and gas accounts for heavy CO2 emissions that recently have become a concern to save the global temperature from reaching the ‘tipping point’. Further, with decreasing reserves and increasing vulnerability due to geo-politic challenges, this energy source has become unsustainable. Despite this countries like India continue to employ a large amount of such energy source. This however, is not without a reason. Most of the medium to long term energy projections studies continue to indicate that fossil fuels still need to play a major role as the “bridge fuel” in the next couple of decades, especially for grid balancing during the transition period towards a greener economy. India is a nation in transition. IESS 2047 highlights that the balance between the need of the country and balancing between other variable will happen with leveraging of clean energy mix. There are some hiccups that still persists with renewables primarily access to technology and cost. Also, penetration of energy remains low as of now. Other limitations include location, accessibility of huge area, variation in wind velocity etc. Nonetheless, the way forward lies in the adoption of the clean and green technology. Apart from this another important aspect of energy security is promotion of energy efficiency. This has to be done both in terms of energy supply and consumption. In terms of production India suffers low plant load and technological obsolescence that hampers the already short supply of fuel. Added to this T&D losses remain very high. The government has now deployed Super Critical and Ultra Super Critical Power Plant that has yielded a positive response. Also Restructured Power Development and Reform program aims at controlling the transmission and distribution losses. For improved consumption practices Bureau of Energy Efficiency and the National Mission on Enhanced Energy Efficiency aim at conservation and promoting best practices including promotion of better electrical equipment/appliances/other machines. On the renewable energy front, promotion of individual and decentralised energy forms will meet the problem of large scale penetration. Also subsidisation on installation and commercial promotions will bring the cost of production down, improving its accessibility and attractiveness. Development of new partnerships like International Solar Alliance, deploying new technology to harness the renewable better like Off-shore wind farms will help off-set probabilities of failure.